We set off from Glasgow at 9.30am on a cloudy Wednesday morning on 8th July 2015, a couple of months in the year earlier (and more than a couple of centuries later) than Thomas Pennant’s (TP’s) first Scottish tour of 1769, which commenced ‘late in the season’ on Sept 5th, 1769. After filling up with diesel and pumping up the tyres on Nigel’s trusty gunmetal-blue Berlingo, we followed Great Western Rd out of Glasgow as it becomes the A82, direct to Crianlarich. We decided on the way out to Dumbarton that we’d follow the direction of TP’s 1769 route into Argyll from Tyndrum to Bunawe on Loch Etive, rather than turning off at Tarbert for Inveraray, in order to follow his Cladich-Tarbert itinerary in reverse. After all, we are bound for the ancient lost city of Beregonium! Despite the pewter sky, Loch Lomond lived up to TP’s description as ‘the most beautiful of the Caledonian Lakes’ (1769 p. 223) – strange though that he only noticed dense oak woods on the eastern bank of the loch, as if the west side (carrying General Caulfield’s military road, and now the A82) was bare of trees. It certainly isn’t today, although it’s hard to see much improvement in the road, especially on the narrow and winding stretch between Tarbert and Ardlui where there’s always a risk of getting stuck behind two ‘Glens and Lochs’ Tour Buses, six caravans and a timber lorry! Rather than hunting for the ‘gravestones of great antiquity’ in the Dalmally graveyard (next time), we decided, anachronistically, to follow the old military road on the first stage of its route to Inveraray, in order to visit the Duncan Ban MacIntyre Monument on a hill above the village, which provided a dramatic view of Loch Awe, Ben Cruachan, and Kilchurn Castle. We saw rain to the east, blue sky and some white cloud to the west, a good portent as we were ‘stepping westwards’. 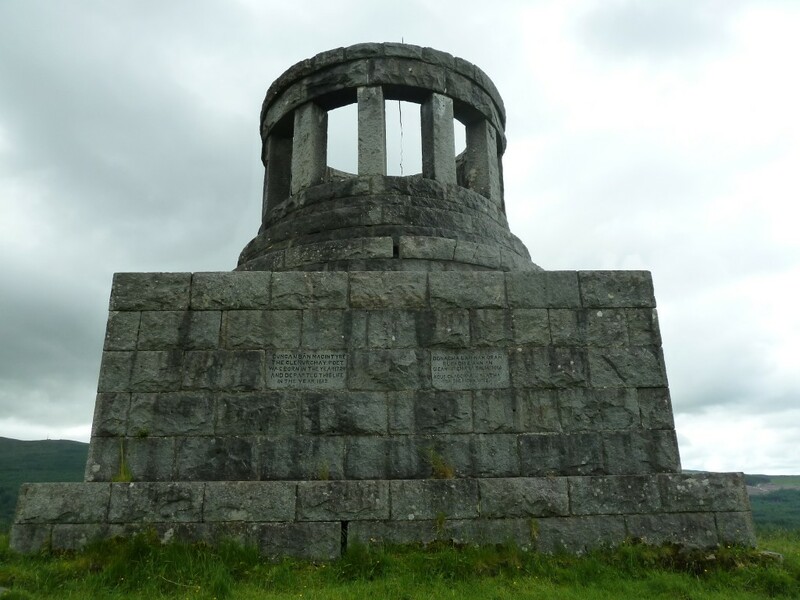 The monument to the great 18th century Gaelic bard of Ben Dorain is an ugly looking piece of Victorian masonry in gray granite erected by public subscription in 1859, rather like a water-works tower, but the view from it is exceptional. Macintyre was apparently illiterate, but dictated his Gaelic poems to Rev Donald McNicol of Lismore, author of the hard-hitting Remarks on Dr Johnson’s Journey to the Western Isles (1779). As the greatest Gaelic nature poem of the 18th century, ‘Moladh Beinn Dobhrain’ provides a fascinating point of comparison with TP’s description of the Highland environment, the work of a man employed as a forester and deer hunter on these hills, in the pay of the Duke of Breadalbane. He spent many years in Edinburgh’s City Guard, probably one of the thuggish crew, wielding their Lochaber axes, that Robert Fergusson rails at in his poem ‘Auld Reekie’. Macintyre is buried in Edinburgh’s Greyfriars Kirk alongside George Buchanan, the geologist James Hutton, and all those dead Covenanters, as well as their persecutor, Sir George Mackenzie, whose mausoleum is haunted by a scary poltergeist that allegedly buffets and bruises visitors. With some difficult we found the unsigned entrance to the car park for Kilchurn Castle, just beside the Glasgow-Oban railway line. 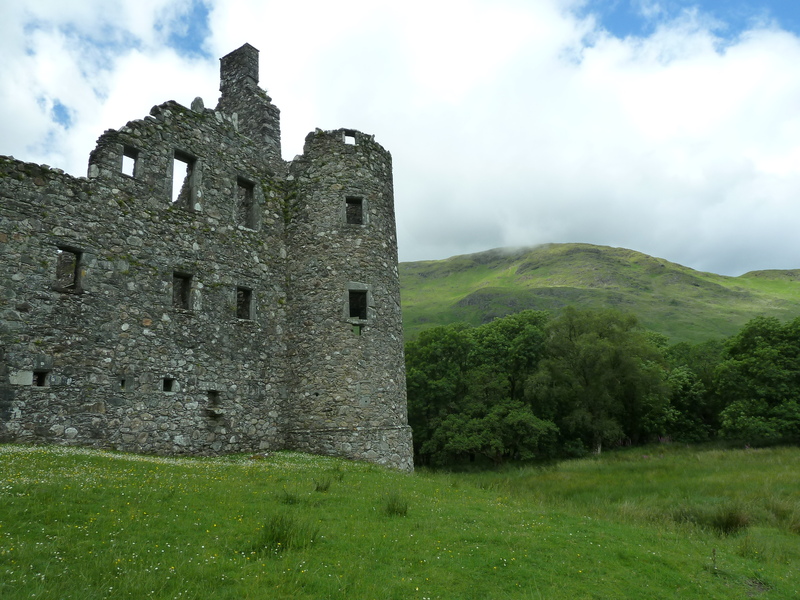 The castle is strikingly situated on a boggy green promontory looking out over Loch Awe, and despite the lack of signage it was full of enthusiastic French and German tourists. The engraving after Moses Griffith published in Tour 1769 shows (unsurprisingly) how much more complete the castle was than it is today, despite the bushes growing out of its turrets. 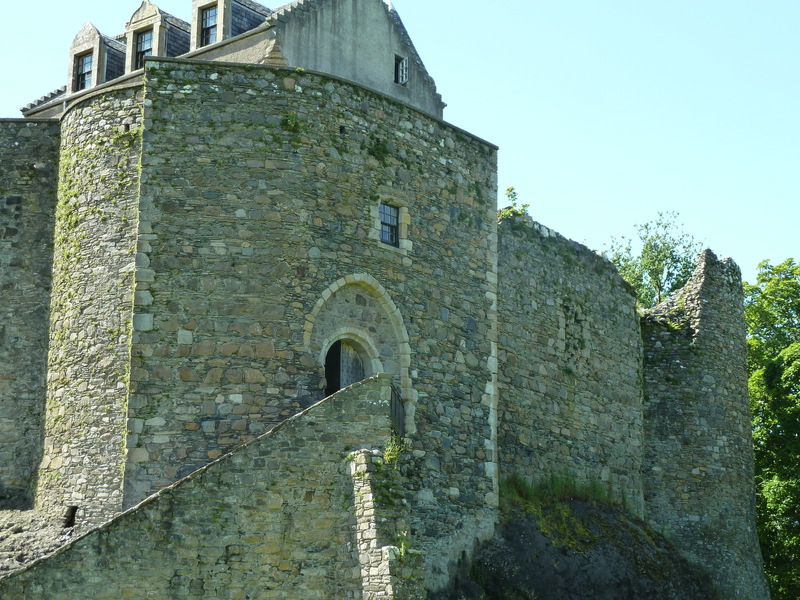 But the medieval castle had been largely reconstructed as a government barracks after the first Jacobite war in 1689. TP describes it as ‘now a ruin, having lately been struck by lightening’, (p.216) and sure enough, the first information panel to meet our eyes on entering the gate informed us that the heap of rubble upon which it was erected was all that remained of a turret demolished by lightening. Driving along the A85 to the Pass of Brander past the extravagant Victorian Gothic St Conan’s kirk, we caught a glimpse of ‘Fraoch-Eilan’ which TP called ‘the Hesperides of the Highlands’, the setting for a Gaelic ballad ‘Bas Fraoch’ translated into English and published by Jerome Stone in 1756 under the title ‘Albin and the Daughter of Mey’. (p. 217) We passed under Ben Cruachan ‘its sides shagged with woods impending over it’ but we are going to get to know it better tomorrow. The Pass of Brander would have looked very different in TP’s day before the loch was dammed, which has put paid to ‘the turbulent course of a series of cataracts, for the space of three miles’. We arrive in Taynuilt, and hungrily devour bacon, cheese and chili jam toasties in ‘The Robin’s Nest’ café in the village. After lunch the sun has come out and we drive on down the road to Bonawe on Loch Etive, where the 18th century iron foundry mentioned by TP is now maintained by Historic Scotland. (It’s not clear from the narrative whether TP actually visited Bonawe in 1769, or just described it from the head of Loch Awe.) We seem to have been the first visitors of the day, and the HS custodian gave us a helpful introduction to the site, which we stroll around in the warm sunshine. 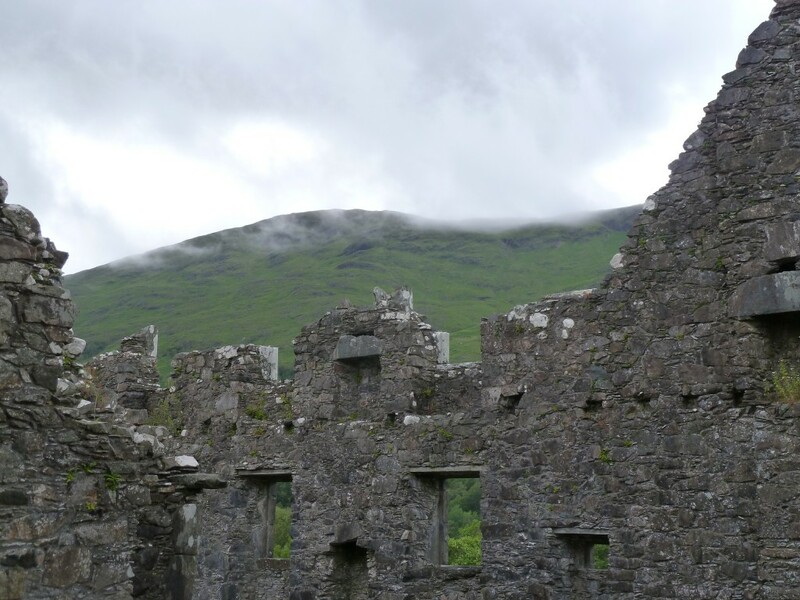 Visiting an early industrial site in the West Highlands was true to the spirit of Pennant’s tours – we admired the size of the warehouses, the furnace and the spectacular mountain backdrop. 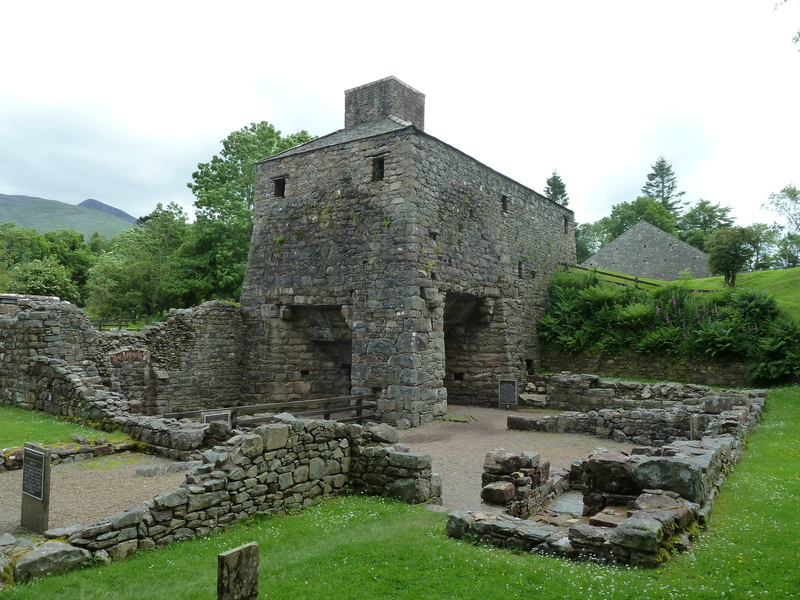 The strange vernacular-style storage sheds are its strangest feature, so out of scale with other buildings of the period in the Highlands: the size of the one for storing charcoal (and keeping it dry in the rainy climate) was twice the size of that for the iron ore, in proportion to the quantities of both needed for production. Bonawe was established in 1753 by an iron company based in NE England, and located here because of the abundant supplies of charcoal, which had been exhausted in Westmoreland, so it was cheaper to import the iron ore by barge to Argyll and smelt it into pig iron here. TP worried that the foundry ‘will soon devour the beautifull woods of the country’, but in fact the company practiced an early form of sustainable woodland management by carefully coppicing the trees, and the extent of woodland here had actually increased by the time that the foundry ceased production in 1876. Amazing it was in operation for so long, considering that charcoal smelting had been superseded by coke after 1750, which fuelled the enormous foundry at Carron near Falkirk visited by TP and all other tourists to Scotland in the 18th century. (‘The greatest of the kind in Europe…the buildings of all sorts are of vast extent, and about twelve hundred men employed’). 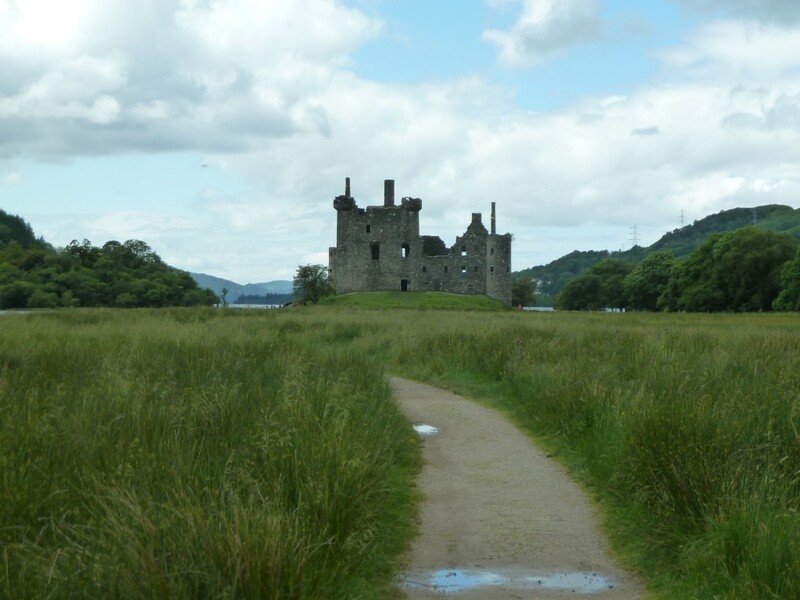 (1769 p. 242) At this point we part company from TP on his 1769 tour, assuming that he made it as far as Bonawe: he next mentions the village of Cladich on the southern side of Loch Awe (if he did visit Bonawe, he’d probably have reached it via the Portsonachan Ferry over Loch Awe). From there he proceeded southwards on the newish military road to Inveraray, at the start of his homeward trip via Glasgow. As we leave TP 1769, we pick up the trail of his 1772 tour. 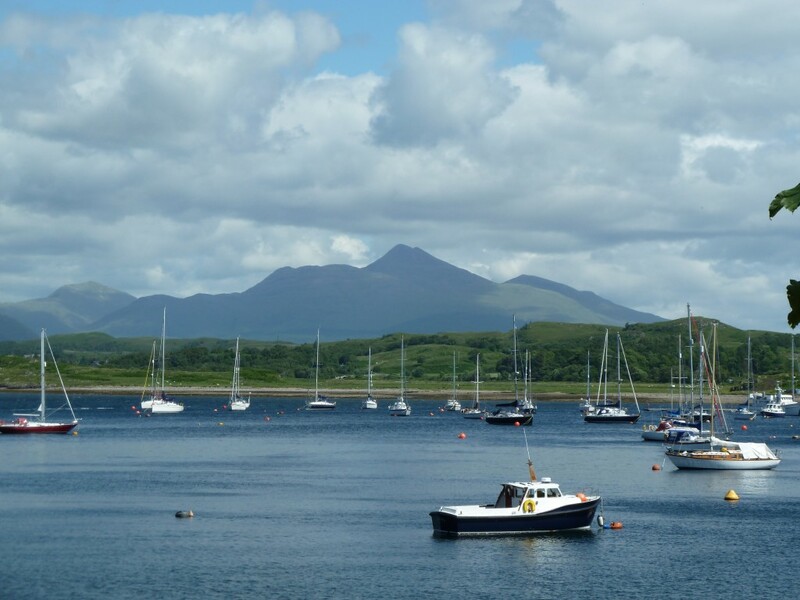 Having sailed down from Skye via the Sound of Mull on the Lady Frederick Campbell, TP anchored ‘under the ancient castle of Dunstaffnage, or Stephen’s Mount; and instantly receive[d], and accept[ed], a most polite invitation from the owner, Mr Campbel’. (1772, p. 355) Pennant and his party evidently made the short excursion to Benderloch on horseback, returning to spend the night on board their ship. We drove on west from Taynuilt in now blazing sunshine past the Connel bridge and the swirling eddies of the Falls of Lora – Ossianic name! – to Dunstaffnage Castle, aware that we really were now on ‘classic ground’, even if it felt more like the outer suburbs of Oban. (I thought of Alan Warner’s hilarious 2002 novel The Man who Walks, set in this very locality.) The castle is built on huge chunks of naked rock, (‘the pile is seated on a rock, whose sides have been pared to render it precipitous, and to make it conform to the shape of the castle’) (p.355) but we didn’t manage to locate the echo mentioned by TP in the ‘high precipice’ near the chapel. It was already 3.15pm and we were worried that we wouldn’t have enough time to do justice to the Lost City, so contented ourselves with walking round the ruins and photographing the site. Near the approach is a marine bio-technology plant which Alex guessed produces antibiotics for fish farm salmon– quite a strange juxtaposition. At about 3.30pm we pulled up in the parking lot on the A828 by the hamlet of Ledaig, just before Benderloch, having passed Oban airport on the north side of the narrow, single lane Connel Bridge. On our left was the most beautiful beach of white stones and the great curving bay of Ardmucknish. 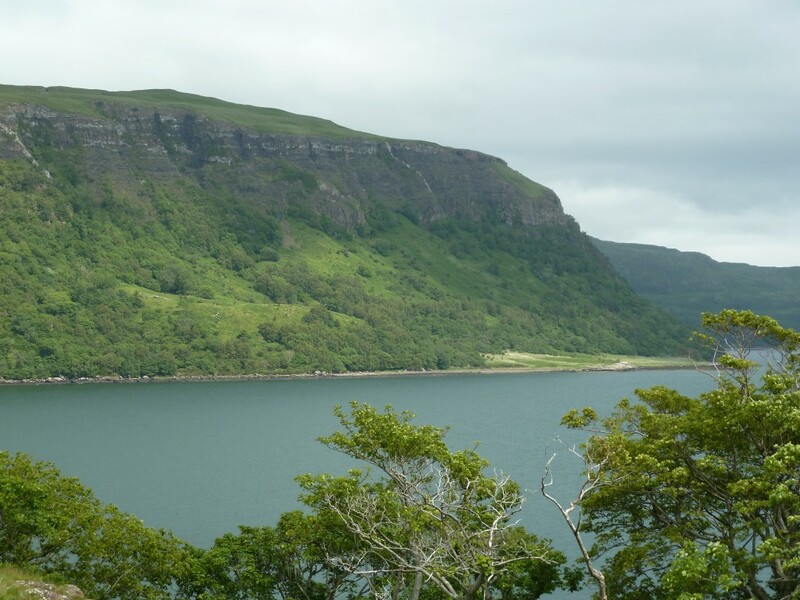 Looming over us was the high wooded escarpment of ‘Dun-valire’, on which Dalriadan watch-towers were allegedly situated. If only the locals could grasp the massive importance of the fact that their village is built on the site of Beregonium and Fingal’s seat of ‘Selma’: imagine the economic benefits from global tourism and possibly UNESCO world heritage status – Oban airport rebranded ‘Finn mac Cumhaill International’ etc. etc. Consulting the OS Adventurer map of the area that I’d picked up in Glasgow in preparation, as well as the map of the ‘Site of Fingal’s Selma’ from Sir John Sinclair’s 1807 edition of Poems of Ossian in the Original Gaelic, we headed along the road, but our excitement when we reached the site of Beregonium was dampened a little by a large sign at the entrance to the large white house occupying the site: ‘Private Property – Keep Out’. We couldn’t see any trace of ‘Straid-a-Mhargai, or Market Street’ but the white house has a standing stone in the field just outside his back garden, one of the two mentioned by TP. 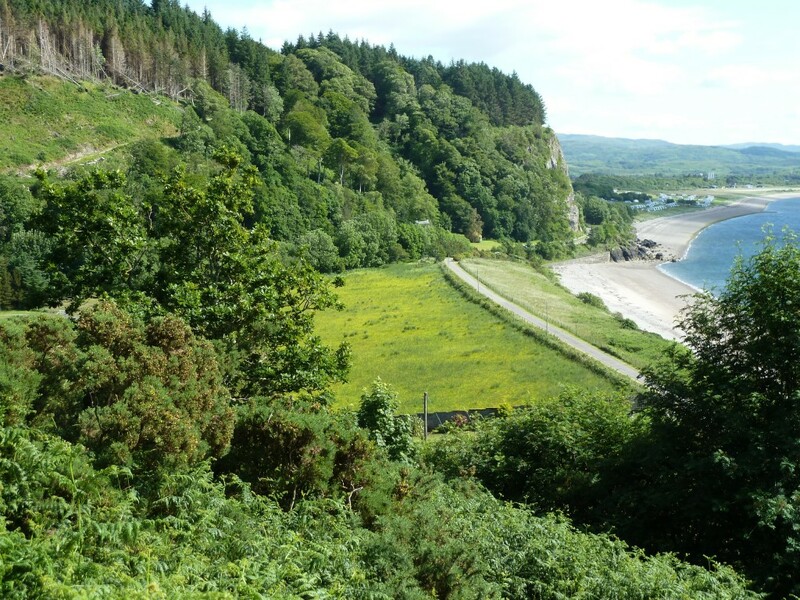 Strolling along to the village we followed the signs to ‘Port Selma’ through a wood, a vestige of 19th century Ossianism, and arrived at the longer stretch of beach on the far side of the second escarpment, the iron age vitrified fort of Dun Mac Uisneachan (‘The Fort of the Sons of Uisneach’). We had with us a copy of R.A. Smith’s wonderful Loch Etive and the Sons of Uisneach (1879) from Glasgow University library, which contains chapter-and-verse on Beregonium, the ‘castle of Fergus and Selma’. It contains an engraving of the Dun, completely treeless in the 19th century – and no sign of course of the white house or modern development that now covers the ground. TP describes ‘Dun-mac-Sniochain, the ancient Beregonium, or Berogomum’ (p.356) as ‘an oblong insulated hill, on whose summit, the country-people say, there had been seven towers: I could only perceive three or four excavations, of no certain form, and a dike round them’. (1772, p. 358) The earlier traveller Bishop Richard Pocock has more detail – citing George Buchanan’s History and Camden’s Britannia as his sources, but also the following: ‘in the new map of Scotland it is called Berigonium, and seem’d to have been anciently the Chief City of Scotland’ (p.69) That’s a reference to the forged Richard of Cirencester De Situ Britannia that fooled the great antiquarian William Stukeley. Smith traces the legend of Beregonium back to the early modern Aberdonian historian Hector Boece. 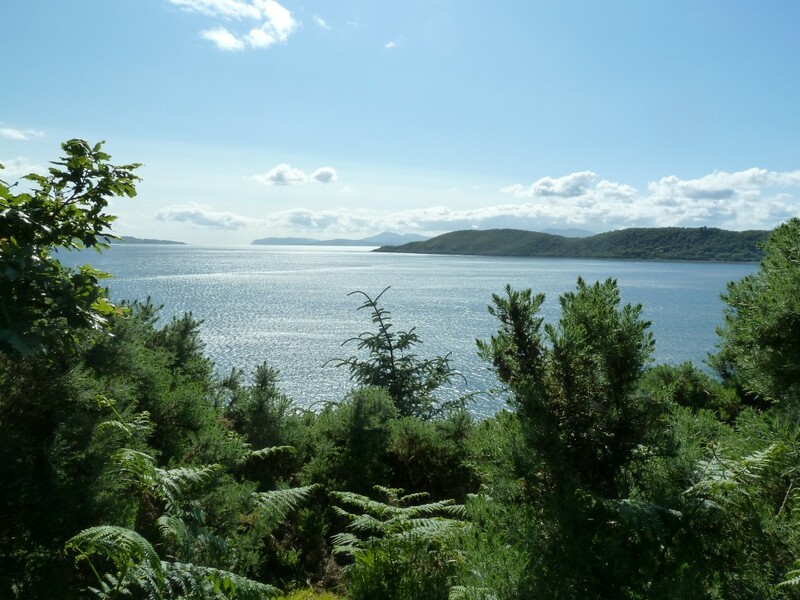 Struggling through dense vegetation over what felt like various earthworks to the seaward end, we admired the magnificent view of the sun sparkling on the waves in Ardmucknish Bay, and over to Mull, Lismore, and the hideous white scar of the Superquarry on the hills at Glensanda on Morvern. Otherwise a wonderful view, but we thought that TP was lucky not to have to contend with a nose full of dust and bracken spores in the treeless 18th century. Looking down on the site of Beregonium, we couldn’t make out any traces of Market Street, and took some photos before clambering down the way we had come up. 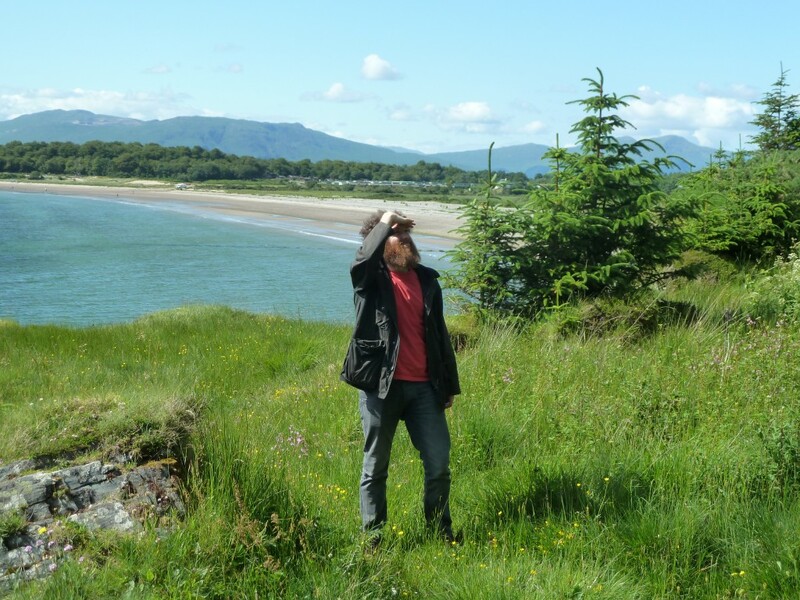 Returning to the car via the beach, we stopped to look at the little graveyard by the road which is all that is left of Kilcolum Cille – no sign at all of the ancient Celtic kirk though. As it was getting late, now after 5pm, we got in the car and headed north through Appin to the Corran Ferry, stopping for water in the Benderloch stores to quench our thirst. We arrived spot on just as the ferry was about to leave for Ardgour, having admired the hills of Morvern across Loch Linnhe, more usually swathed in Ossianic mist. Sailing up the Sound of Mull in the summer of 1772 en route to Iceland, Joseph Banks (who’d recently returned from exploring the Pacific with Capt Cook) made the following entry in his journal: ‘Morven the land of heroes once the seat of the exploits of Fingal the mother of the romantic scenery of Ossion. I could not even sail past it without a touch of enthusiasm sweet affection of the mind which can gather pleasure from the empty elements & realize substantial pleasure which three fourths of mankind are ignorant of. I lamented the busy bustle of the ship & had I dar’d to venture the censure of my companions would certainly have brought her to an anchor. To have read ten pages of Ossian under the shades of those woods would have been a Luxury above the reach of Kings’. Famously, Banks went on to visit ‘Fingal’s Cave’ on nearby Staffa, his account of which was published in Pennant’s 1772 Tour – its not hard to see why he had a role in naming the basaltic cave! We drove up the single-track road through the wildness of the White Glen in sunny early evening, arriving at our accommodation for the night, Acharn Farmhouse, about 6.30pm. Alex and I had a cup of tea and strolled down to Loch Arianas, keeping in the archaeological mood by admiring the bracken-covered kist burials at the edge of the Acharn infield. 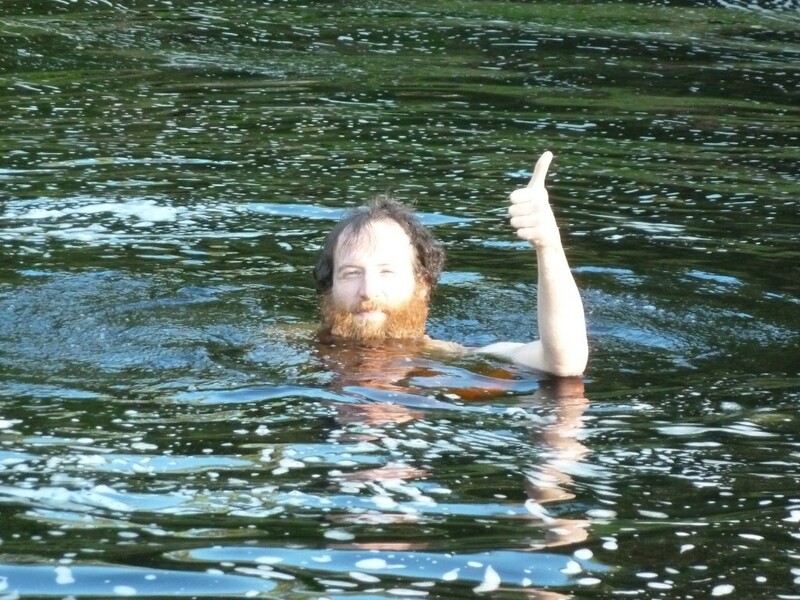 We’d booked into the White House Restaurant for 8pm so just had time to jump in the river and wash off the dust of Beregonium before driving the 5 miles or so to Lochaline, where we had a fantastic dinner of local seafood. Emerging at 10pm into the still bright summer evening light, we headed over to Kiel Kirk to look at the medieval Iona School carved stones, and peer at some of the grave inscriptions in the churchyard, with its magnificent view over the Sound of Mull. And so to bed (after a glass or two of Talisker) to dreams of lost cities and the mouldering relics of antiquity, and to rest before our climb up Ben Cruachan tomorrow. 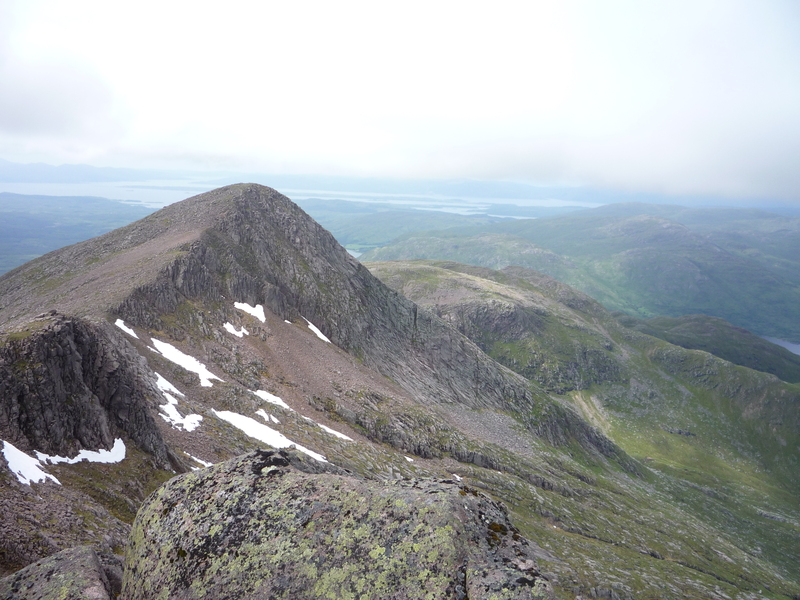 Rocky peak of Stob Dearg, West of Ben Cruachan. Ben Cruachan is a secretive mountain, despite its size. Thomas Pennant couldn’t have failed to notice its bulk as his ship zig-zagged through the Sound of Mull on his 1772 voyage to the Hebrides. Travelling the banks of Loch Awe in 1769, he had remarked that among the ‘vast mountains’ of Northern Argyll, ‘Cruachan towers to a great height; it rises from the lake, and its sides are shagged with woods impending over it.’ (1769 p.237) But the mountain’s peak and those of its neighbours only come into view from certain angles, through openings in its flanks. In its hinterland, the mountain is more presence than spectacle. We began our ascent in a layby of the A85, the arterial road of the west Highlands. 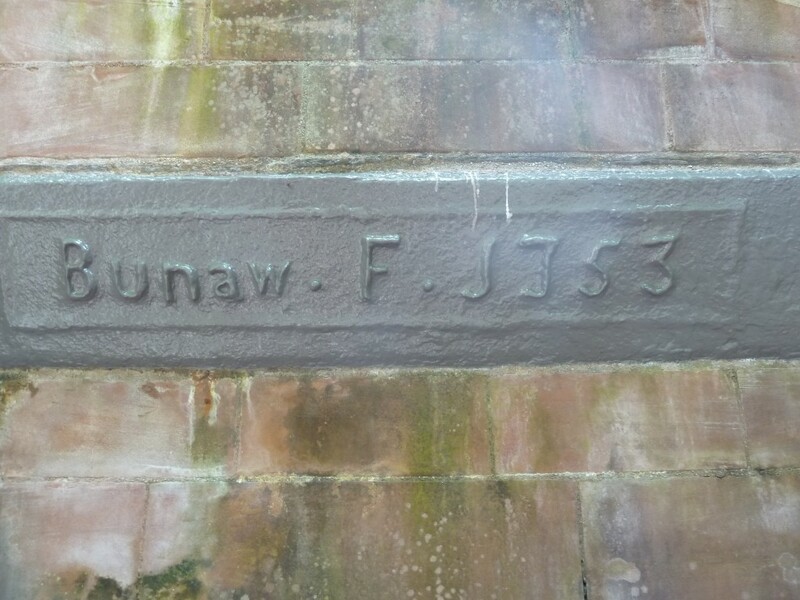 Immediately to the north, it runs out of dry land, and a sweep of tarmac is suspended over the water of the now dammed pass of Brandar, a manmade arm of Lochawe. The railway line to Oban runs parallel to the road, and the Falls of Cruachan intersect both as they rush through the steep lower slopes of the mountain. The first stage of the ascent ducks below the railway and a small unmanned station before climbing sharply alongside the falls of Cruachan. There’s a small power substation at the head of the path, an enigmatic collection of ceramic coils behind a tall fence. 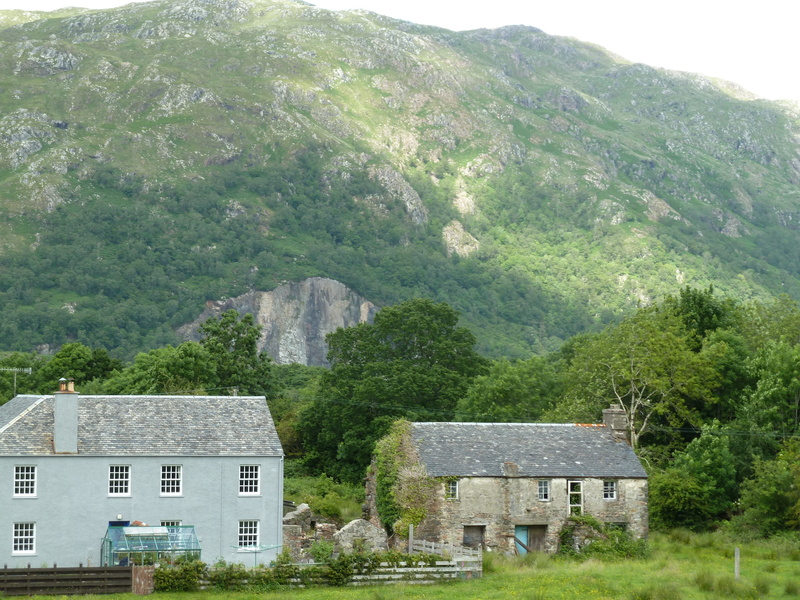 Cruachan is now called ‘The Hollow Mountain’, after the vast cave that was excavated beneath during the post-war years to house hydroelectric generators. Above ground, the slopes are thick with oak and birch, so that we could hear the constant crashing of water in the gully below us, but were unable to see the falls until the trees cleared near the opening of the upper valley. 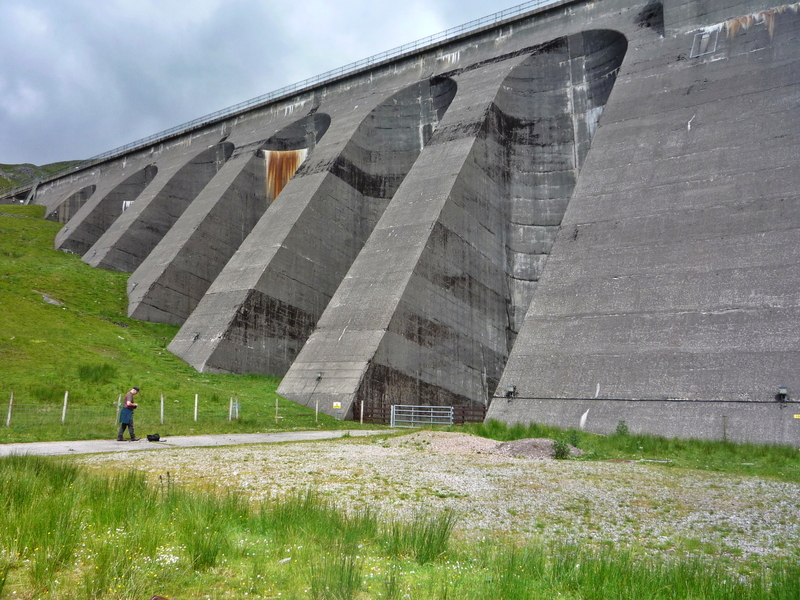 Here, the imposing Cruachan Dam looms, and more odd bits of energy infrastructure sprout from the ground. An access road loops round the slope to the east, and below the dam the deep troughs of overflow channels sink into the hillside. On the path to the reservoir, we were passed by a couple coming the other way. When Nigel asked if they’d been up the mountain, one of them replied that they were ‘not the type for the top’. Perhaps it was the monumental form of the dam itself that drew their interest – like a brutalist echo of the mountain’s granite buttresses – or the eerie atmosphere it creates around itself, both muted and heavy with invisible activity. We stopped briefly on the hardstanding below the dam, among concrete hatches and mushroom-like cowls, where I could just pick out a low frequency hum emanating from the ground. Before the Sun should withdraw his beams she was to cover the spring with a stone, on which sacred and mysterious characters were impressed. One night this was forgotten by the unhappy Bera. Overcome with the chace and heat of the day, she was seized with sleep before the usual hour of rest. The confin’d waters of mountains burst forth into the plain, and expanded themselves into the lake below. 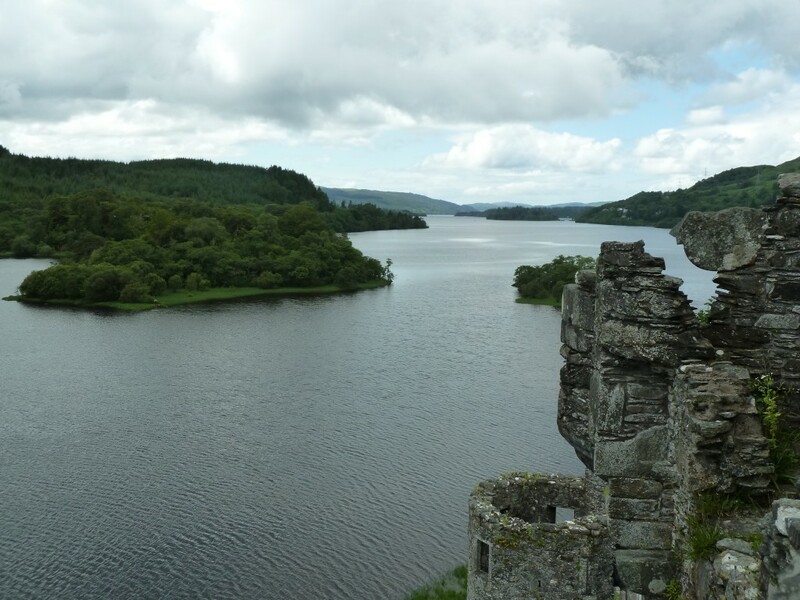 The sudden appearance of Loch Awe might have come as a shock to Bera, but it’s hard to imagine the view from the mountainside without its bright waters winding deep into western Argyle, its elongated course suggesting a third sea loch between those of Etive to the north and Fyne to the south. 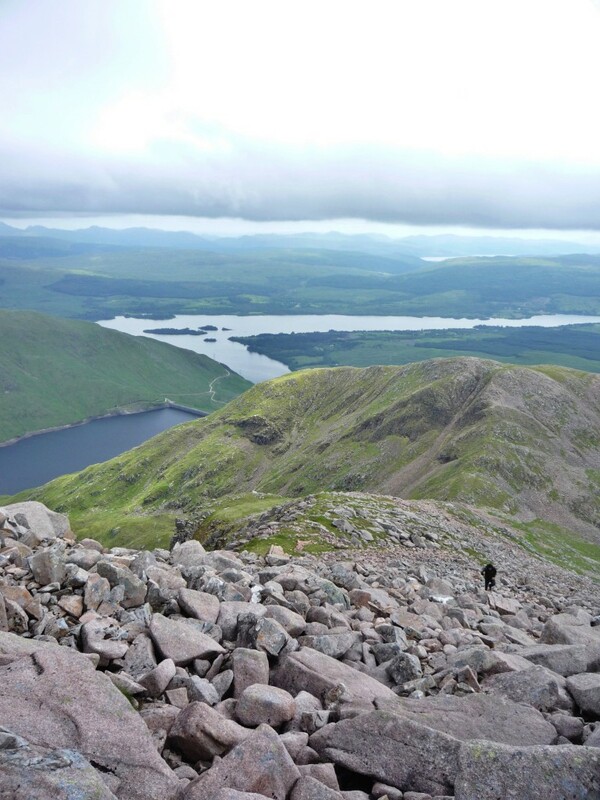 We climbed the sturdy metal ladder up the face of the dam, and the horseshoe corrie opened in front of us, cradling the Cruachan reservoir into which burns and waterfalls drain from the crags above. A few ewes and their lambs picked their way over the little precipices of the glaciated valley floor, deaf to the anti-sheep sentiment directed their way by Nigel. The rock of the mountains is pink and grey, and where it isn’t, the grass seems to present a uniform green. But we found ourselves thinking of the Enlightenment botanists who eagerly scoured this part of the world in search of tell-tale flowers and succulents – little ornaments of northerliness and altitude that aligned the Highland environment with Scandinavia and the Alps, rather than the Lowlands of Scotland. When Pennant returned to Scotland for his Tour of 1772, he didn’t come alone, but with a retinue that included the botanist reverend John Lightfoot, as well as his own ‘servant painter’, Moses Griffith. Pennant later bankrolled the publication of Lightfoot’s 1777 Flora Scotica, a taxonomic arrangement of Scottish and Hebridean plants according to the sexual system of Swedish naturalist Carl Linneaus – though Pennant got the most out of his money by slipping his own ‘Caledonian Zoology’ into the book’s opening sections. Lightfoot’s botanical descriptions are interspersed with Griffith’s drawings of Scottish flowers. Despite a century or two of overgrazing by hungry sheep and deer (there are tall fences to keep the latter away, though it’s hard to tell whether from reservoir or road) some of those plants still cling on here. 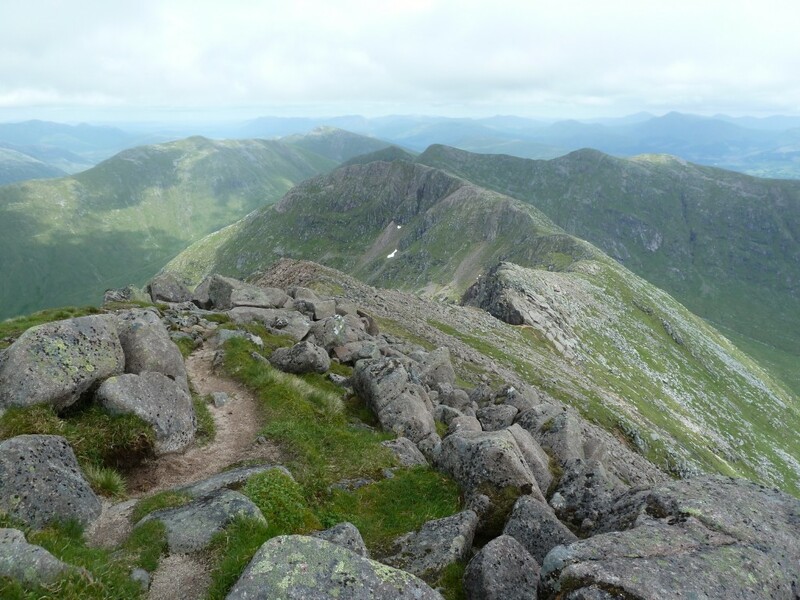 Cruachan’s grass and rocks are beaded with flowers and ferns, and pillowed by bright efflorescences of moss, while tough succulents make the most of the variegated ground left by the sloughing of boulders and scree from its slopes. 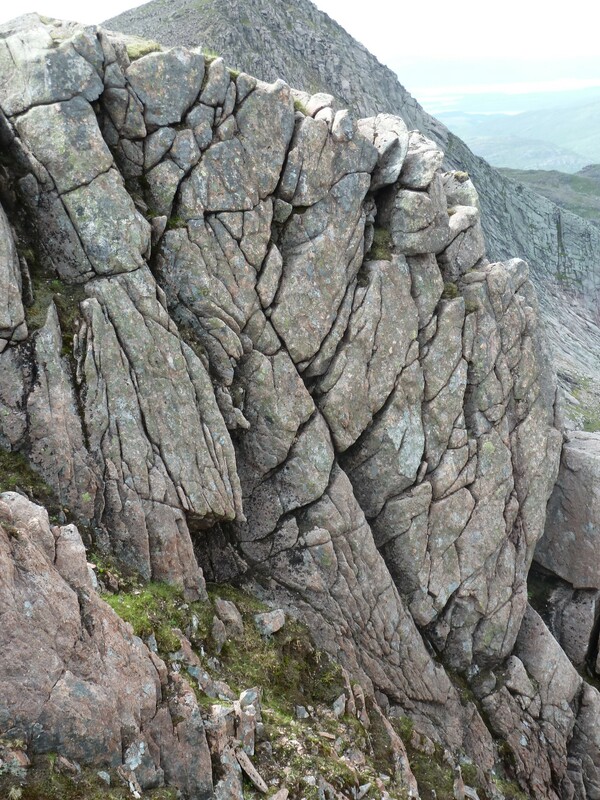 Upon the sides of rivulets, and upon moist rocks near the summits of the highland mountains, very common. It grows upon Ben-Lomond, from about halfway up quite to the summit; and the same very nearly of most other high mountains. There’s an attractive lightness to these botanical descriptions, with their language of hairiness and tufts, colour and shape. Just enough detail is given to distinguish between varieties – it’s only the dabs of yellow on the petals, just visible in my photograph, that give away the Starry Saxifrage. Below and to the south of the main ridge, we noticed clusters of small, bell-like purple flowers on solitary stems, just low enough to keep out of the wind and above the grass. 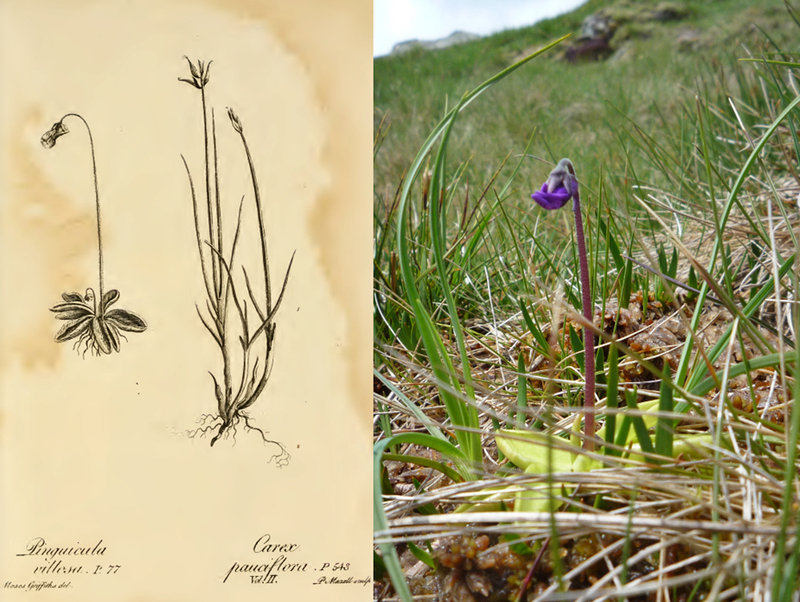 These are a type of Pinguicula or Butterwort, a less common variety of which was illustrated by Griffith for Flora Scotica. In fact it’s a carnivorous plant, the lip-like leaves at its base able to trap and consume insects – which strikes me in my ignorance as a strangely exotic fate for a Highland fly. 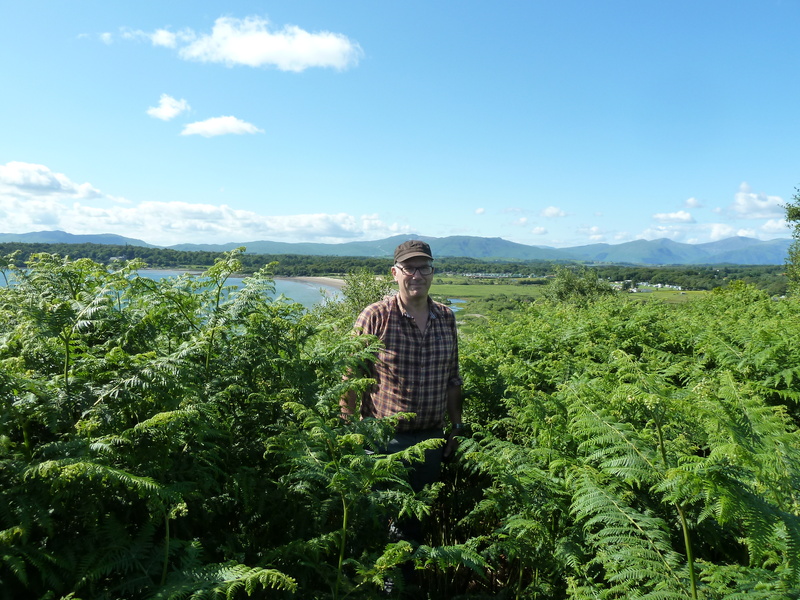 Botanists present a different truth of the Highland landscape to that of the painter or picturesque view-seeker. Their mountains are not majestic and powerful forms, but proliferations of diverse, miniscule places, nooks and crannies, gaps between rocks, the sides of rivulets – spots whose differing characters give home to different types of life. We reached Cruachan’s summit by mid-afternoon. The last stage was steep and forced us to clamber over fat granite boulders, though their rough surfaces provided reliable grip for our boots. The wind dropped suddenly at the top, giving way to a stillness in which we could hear rooks calling to each other as they skirted the precipices below. The rain promised by the forecast materialised as a raft of white clouds which blew in from the sea and wreathed themselves benignly around the crags beneath us. Large islands of blue sky had formed above, and by the end of day I found myself sunburned rather than drenched. Two hillwalkers from Fife were already here. They later followed the crenellated spine of the range to complete the horseshoe circuit over Cruachan’s neighbours to the east and south. 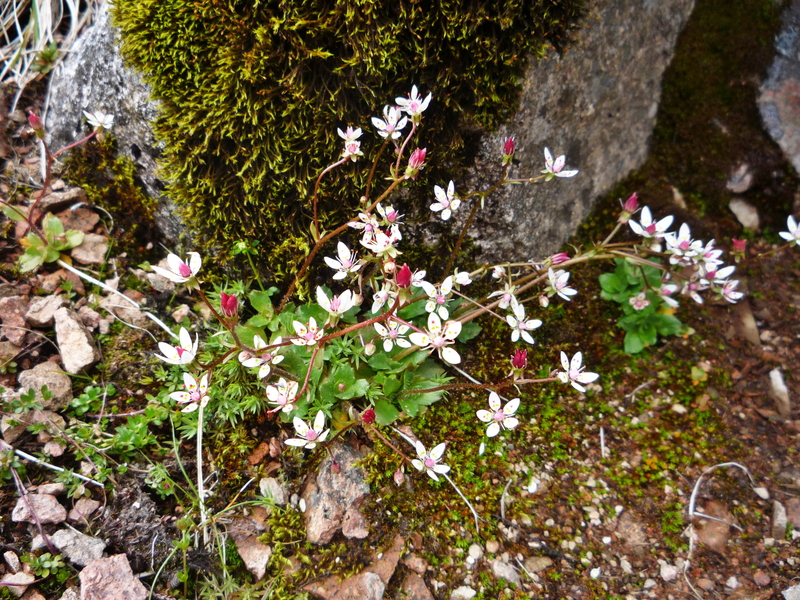 Like us, they were surprised by the quantity of snow still draped around the rocky buttresses of the northern slopes, even though it was mid-July. Beyond the snow, the sheer upper flank of Cruachan’s neighbour, Stob Dearg, appeared almost concave, its surface dense with the spiral tooth-marks of erosion. While we refuelled with chocolate and sandwiches, we were joined at the summit by a man and woman. They soon absorbed themselves in weighing up whether enough time remained in the day to complete the full route along the eastern ridge. Nigel and I chose the opposite path, striking out west along the narrow ridge to Stob Dearg, where the exposed rock is busily scored and sculpted by cold and water. 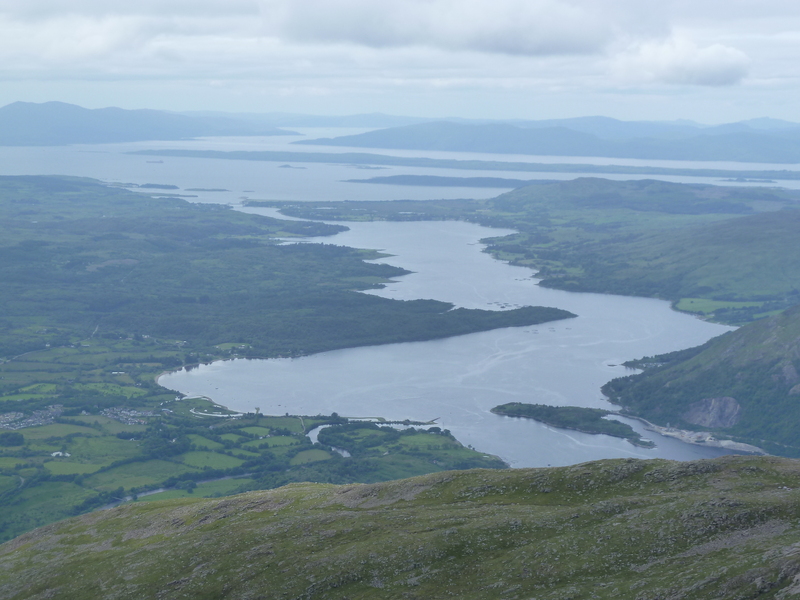 From this second summit we took in open views over the islands and peninsulas of Mull, Rùm, Lismore and Morvern. After one last look over the Heath of Lora and the line of low, cliffy hills that terminates at the site of Beregonium on the shores of Ardmucknish bay, we turned and began our descent. 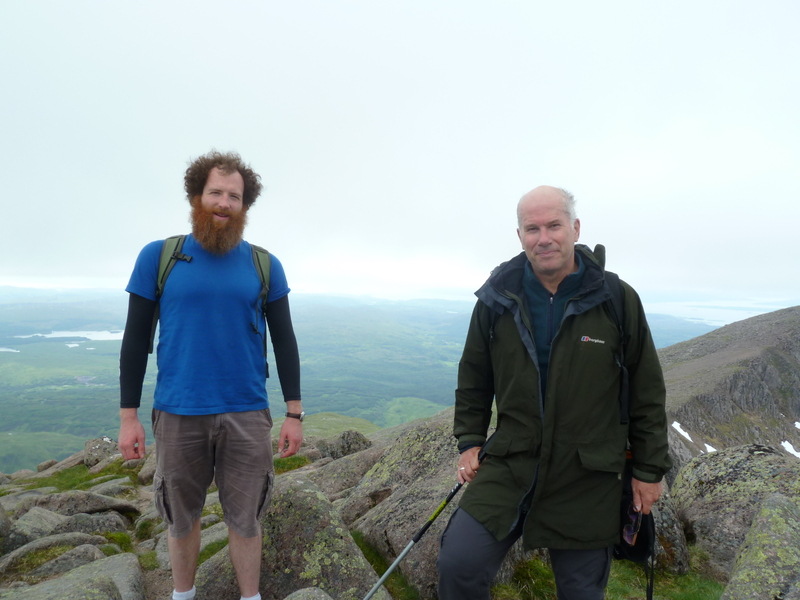 At Nigel’s suggestion, we deviated from the ridge and headed straight across the south slope to try and find the path at the bealach, hoping to avoid the boulders near the summit of Cruachan. In the event, we had to traverse a few long sections of slab where the turf is unable to cling to the side of the mountain. We made it back to the saddle tired and thirsty, but without catching any bad slips or falls. From there, we went down to the silence of the dam, where the peaks of Cruachan and Stob Dearg slide out of view behind the slopes of the corrie. This entry was posted in Walkers' Blog on 25th August 2015 by Luca Guariento.